New data recovery software designed to assist with a variety of operations -- including hard drive data recovery -- can help when disaster strikes. 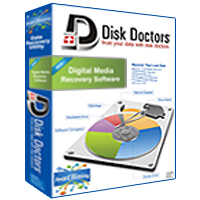 Disk Doctors has launched Digital Media Recovery, a powerful software is designed to retrieve deleted, or corrupted, files from Memory Cards, USB Storage devices and hard drives. What if you were to accidentally delete the photos and videos from your wedding? What if the memory card with your holiday pictures were to suddenly stop working? Or what if your entire collection of mp3 files were to get wiped out by mistake? And all without a back-up? "In a digital age when most of us depend on digital media to store our memories, our music, we are prone to situations like those above. That is, sometimes, the stuff nightmares are made of," said Omer Faiyaz, VP Marketing with Disk Doctors. "Today, most of us believe in just posting picture files onto a Snapfish or a Picasa, instead of printing them out in a time-honored fashion, or storing music on a memory card that can be slotted into a phone for easy listening. And with the convenience come all of those little slips that can lead to information loss. In some cases the loss is trivial, so we are not too inconvenienced. But often the it is extremely important, either personally or professional." This application comes packed with advanced features, an easy-to-use interface, and has support for RAW photographic files. A must-have for SOHOs, Corporates and professional photographers. Features for this version include a fast thumbnail-viewer, enhanced support for RAW formats as well as an option to burn recovered files directly onto CD / DVD media (this last feature depends on the options permitted by your hardware). For music and video files, the new application is equipped with a specially crafted retrieval engine that can identify each fragment of a lost or deleted mp3 or mpeg (mpg) file; it creates a virtual map to determine the file size that results in a working file, whereas existing retrieval applications recoup only fragments or parts of music and video files. The currently launched version of the software reclaims lost or deleted pictures, music and video files from Memory Sticks, Flash Cards, Sony Memory Stick, IBM Micro Drive, SD Cards, MMC Cards, XD Cards, Secure Digital Card, Zip Disks and Mini Disks. It comes specially designed with support for all major camera brands - Nikon, Canon, Olympus, Sony & Minolta, among others. Disk Doctors Data Recovery Labs is one of the most trusted and respected companies providing data recovery services since 1991 with over 50 dedicated labs in the world. Disk Doctors engineers are among the most experienced and professional information retrieval experts in the world, working towards a common goal to bring clients halted operations back into working condition with the quickest, cost effective and quality service available. DD have excelled by miles in developing various techniques which required intensive consistent research & development. These path breaking technologies have made some of the complex cases possible. Disk Doctors current products portfolio consist of several information retrieval and system utilities. The company recently launched new data recovery software designed to assist with a variety of operations -- including hard drive data recovery.